L’Oreal Paris is one of the known makeup and cosmetics brand in Pakistan, L’Oreal Paris products are getting very famous in Pakistan since 2009, most of the girls and women preferring L’Oreal products such as lipsticks, nail polish, creams and hairsprays. 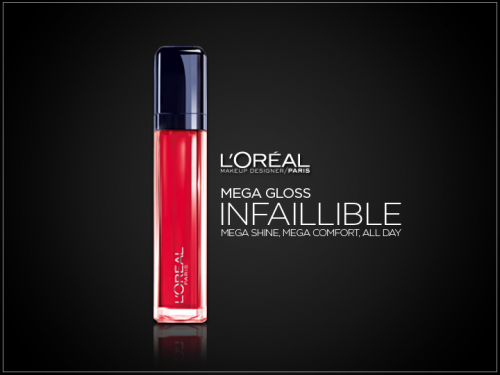 So Lipgloss is one of them which is very demanded product by L’Oreal Paris in Pakistan, As you know this article is the review of L’Oreal Paris Infallible Mega Gloss so i will try to cover its pros and cons at my best so it will help you to purchase it Online. The formula is enriched with hyaluronic acid and shine color pigments, leaving lips hydrated lips with a high level of shine for a glossy look, without stickiness. The lip shaper applicator contours and hugs lips for a perfect pout, all day. Such a beautiful colors and shiny pigmentation, the package is smooth and glossy and makes expensive feel. The wand is very easy to apply the gloss on lips, and the smell of bubblegum is very sweet which screams that just put me on your lips. Shades are absolutely very amazing , though not every shade is available in shops but you can find them online, The only thing which i did not like is glittery feel on lips after put on the lipgloss. First apply the mega gloss onto your lower lip from center to the corners, repeat the same step on your upper lip, to achieve the perfect shade effect pay attention to your eupids bow and leaving the middle of your lips opaque and shinier in color. Apply Infallible Lip Top Coat for an even glossier effect.